Every morning in Senegal, there are hundreds of individuals walking along the sides of highways. Very often, they cross the highway without paying attention to the traffic - and are struck down in horrific accidents. Khassamiyou was one of these individuals. Khassamiyou was 11 years old when his accident occurred in 2004. Trying to cross the road, he was struck by a car that did not see him. Unfortunately, his leg was beyond saving, and was immediately amputated in Dakar. 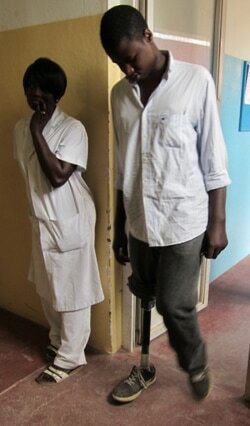 For the next several years, Khassamiyou struggled to find a prosthesis that would work for him. As an active young boy, he was consistently breaking the prosthetic components he had been provided with. Part of the difficulty for Khassamiyou arose from having to use single axis joints - joints that can be unlocked to bend for activities such as sitting, but must be locked for normal walking. In 2010, Khassamiyou was fitted during the LIMBS Technology Certification Workshop (TCW) in Senegal. At first, he was very tentative about the LIMBS Knee, because he had never had a free-swinging knee joint. However, as he continued to practice walking, and began to trust the stability and mobility of the LIMBS Knee, a smile crept onto his face. He was excited by the fact that he'll be able to go to school and use a joint that bends like a normal knee while he is walking. He is currently finishing up high school, and promises to visit the LIMBS team upon their return visit to Senegal to show us all the progress he has made using the LIMBS Knee. We are very excited for him!